Across the United States, in 2015 alone there were nearly 400,000 truck accidents, including fatal collisions. Closer to home, the Arizona Department of Transportation (ADOT) reports more than 2,500 accidents involving commercial trucks each year. The size and speed of most commercial semi-trucks and tractor trailers make them the most dangerous vehicles on the road. For everyone else driving smaller, passenger cars, even low-speed collisions could lead to serious personal injuries, wrongful death, or irreparable damage to your vehicle. The financial and emotional burden a truck cash can leave behind is one that you shouldn’t have to shoulder alone. If you or a loved one has been in a devastating trucking accident, then reach out to an attorney today. Nathaniel B. Preston of Warnock MacKinlay Law has years of experience helping victims of car accidents and wrongful death in Avondale, Arizona, and the surrounding area, receive the compensation they deserve. Trucking accidents are complex and there are a number of factors that could affect your case. Depending on the amount of evidence you have to prove the other driver was at fault for your case, it can be difficult to determine who was at fault and who is liable for compensation. Luckily, Arizona injury lawyers have experience with negotiating a number of personal injury settlements and investigating claims for accident lawsuits. Whether the truck driver in question was inexperienced, driving while distracted, making logbook violations or speeding excessively, a lawyer can help provide liability so you can win the compensation you deserve for your commercial trucking accident. The first step to recovering damage to your accident is reaching out to an experienced lawyer. An attorney has the knowledge and resources needed to investigate your case and determine if your accident and personal injuries were the result of negligence on the part of the truck driver. What safety rules do truck drivers have to follow? Due to the size and weight of commercial trucks, there are additional rules and guidelines put in place to ensure the safety of both the truck drivers and the other motorists on the road. These laws include regulations for the weight of their cargo loads, maximum travel speed, truck maintenance and hour logs. One of the most commonly known examples of a federal regulation for commercial drivers are the Hours of Service rules. According to the law, truck drivers can only be on the road for a set number of hours before they are required to take a break. In order to track these hours, all truck drivers must keep a travel log while delivering cargo in order to notate the time they spend both on and off the road. Unfortunately, there are times when “Hours of Service” regulations are ignored by truck drivers so that they can deliver their cargo at a faster time. Without taking proper breaks, the driver can become fatigued, fall asleep at the wheel, or make dangerous decisions that they may not have made had they been more alert. 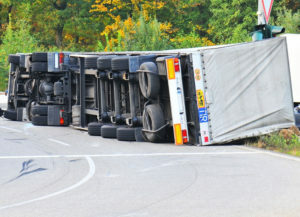 For truck accident settlements, a seasoned lawyer can use their professional resources to determine if the driver took part in any log violations. Commercial truck drivers operate on a set timeframe. The faster they deliver a load, then the sooner they can receive more cargo to deliver elsewhere. While you know that all drivers are required to log their hours to ensure they’re not spending too much time on the road without taking a break, some may ignore this rule in order to ensure a faster delivery time. However, another common tactic in order to deliver cargo on-time or sooner is to drive over the speed limit. Arizona commercial truck law states that no large commercial semi-truck should drive over 65 miles per hour on the roadway. If a driver violates this law and this results in a crash, then they may be liable to pay hefty fines and their insurance company would have to provide compensation for any injured parties. Arizona semi-truck law also regulates the size of commercial trucks. They cannot be more than 28 feet long, however they are allowed to pull two trailers at a time for a total length of 57 feet. If a truck driver is navigating a vehicle that’s longer than 28 feet or has more than two trailers in tow, then they could be cited for breaking these laws. Beyond state and federal guidelines, many commercial truck companies have developed safe driving policies that their employees are responsible for following. These guidelines may be even more rigorous than the federal and state restrictions placed on truck drivers. As a result of a thorough investigation, your attorney may be able to tell you whether the truck driver responsible for your accident was in violation of one of the federal or state regulations mentioned above. If you, you may be entitled to compensation for any resulting injuries or property damage following the collision. While everyone should keep their eyes on the road and try their best not to become distracted, this is especially true for those navigating large semi-trucks or tractor trailers. Distracted driving is considered one of the number one causes of car accidents in America. This could be anything from talking on the phone, texting while driving, or applying makeup while behind the wheel. If there’s evidence that the truck driver involved in your accident may have been distracted at the time, then you shouldn’t have to face the resulting car repair bills or medical expenses that follow on your own. An Arizona car accident attorney can help you hold the other driver responsible by representing you during a truck accident settlement or lawsuit. Due to the size and weight of a commercial truck, even a minor accident can have catastrophic results. It’s important for all truck drivers to keep the safety of everyone else on the road in mind by adhering to the state-imposed speed limit of 65 miles per hour while on the roadway. Too often, a truck driver may ignore this rule, instead choosing to drive at a speed that matches the flow of traffic. Unfortunately, this means that if everyone else on the road is driving over 65 miles per hour, then that truck driver will do the same. Even if a driver isn’t going over the Arizona speed limit, if there are poor weather conditions such as rain, fog, or snow, then they’re responsible for ensuring they’re not driving at such a fast speed that it’s difficult for them to slow down or stop in a safe manner. Who should I call after a trucking accident in Avondale, Arizona? The first few moments following an accident can be very disorienting. You may be left wondering who you should notify first for your safety and wellbeing. Luckily, there are steps you can take to ensure everyone is as safe as possible while also protecting your legal interests. If you, your car passengers, or the other driver involved have suffered any injuries – no matter how minor they may seem – you’ll want to call emergency medical professionals to the scene. Even a minor bump on the head could be something more serious – you never know until you’ve received the proper medical attention. In most collisions involving commercial semi-trucks or tractor trailers, the passenger car suffers major damage and the sheer size of the stopped truck means that surrounding traffic may be left at a stand-still. This is why you should call the police following your car accident. They’ll let you know whether it’s safe for you to move your car and can also call additional offers to aid in the flow of traffic. Another benefit to calling a police office is that they will start an investigation into the accident. They’ll take a statement for you, the truck driver, and any surrounding witnesses in order to create an accident report. This report could include details as to who the officer thinks was responsible for the accident based on what they heard and saw at the scene. Once the report is filed, it becomes public record and you or your Avondale, Arizona, attorney can request a copy to see if it will support your claims for your truck accident settlement. This is why it’s important for you to collect the officer’s information while you are at the scene. This can make it easier for you to track them down in the future. After you’ve called the police and received medical attention, the next step is to call a trucking accident attorney in Avondale, Arizona, to start building evidence for your case. This can be a lengthy process. Your lawyer will investigate everything about the accident – from the initial incident to the aftermath – in order to determine fault for your case. If it is determined that the accident was caused by the negligence of the truck driver, then you can receive compensation for your trucking accident for their insurance company. Proving fault for a car accident can be difficult. Your attorney and the insurance companies weren’t present at the scene of the collision, so it will take hard evidence in order to prove the other party was liable. The commercial truck driver’s insurance company will begin their investigation as soon as possible in order to prove their policyholder was not at fault and therefore they’re not responsible for any medical expenses or car repairs. They’ll look for any reason to reduce the amount of compensation for the accident. That’s why you should hire a who’s experienced in truck accident lawsuits, settlements, and investigations as soon as possible. Seasoned attorneys like Nathaniel B. Preston of Avondale, Arizona, know what to look for when it comes to proving which driver is liable for a commercial truck accident. They can ensure a thorough investigation, collecting witness statements, any videos, or photos of the incident and use this evidence to ensure a fair settlement during the negotiation process. Your car insurance provider should always be notified if you’ve been in an accident. If you collected the other driver’s insurance information, then you can also call their agent, as well, to ensure they’ve been properly notified. How can I settle my truck accident claim? As stated, determining who is at fault for a car or truck accident can be a complex process. The truck driver’s insurance company may try to claim that you were partially or completely at fault for the accident. This means you could receive little to no compensation for any medical expenses, car repairs, or long-term pain and suffering you’ve experienced following the truck crash. In order to increase your chances of recovering damages, your case needs to be based on strong evidence. If you’re able to prove negligence on the part of the driver through witness statements, the truck driver’s Hours of Service log, or photos taken at the scene of the accident, then the insurance company may be more willing to award you the compensation you deserve. Take Photos: While at the scene of the accident, taking pictures of the surrounding area can have a huge impact on your case. Your insurance agent and attorney won’t be at the scene with you, and while an experienced car accident and personal injury lawyer can recreate the incident based their knowledge of the Avondale area and your statements, it could help your case even more if they had photos of what happened that day. This includes photos of street signs, traffic lights, skid marks, and the location of both vehicles. You should also snap pictures of the damage to your car. Collect Witness Statements: Gather witness statements while the incident is still fresh in everyone’s minds. Your lawyer will interview all witnesses that were at the scene, but the information and insight they can provide moments after the accident occurred can be extremely important. Should I file a truck accident lawsuit instead of seeking a settlement? In most cases, your lawyer will be able to negotiate with the trucking insurance company in order to reach a settlement and secure full compensation for your injuries and damages to your car. But, if the insurance company is becoming increasingly difficult to work with or if the truck driver refuses to accept fault for the accident, then a personal injury lawsuit may be the best way to ensure you receive the compensation you deserve. If you’ve been in a collision with a commercial semi-truck or tractor trailer and have suffered damages, let an experienced Avondale, Arizona trucking accident attorney fight for your right to proper compensation. Nathaniel B. Preston of Warnock MacKinlay Law can help you seek a fair settlement from the truck driver’s insurance company. Our number is 602-652-2009.